This is a cultural history of rabies. 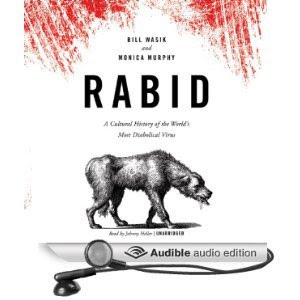 Bill Wasik is a journalist, and Monica Murphy a veterinarian, and they've put together an amazing, and amazingly readable, account of the history, mythology, and science of rabies, the only disease we know that has a nearly 100% fatality rate. Rabies kills, and while it's doing that, it drives is victims mad, with interludes of lucidity when they know what's happening to them. It also, though most of history, mostly reached us through the most familiar of our domestic animals, our dogs. This is perhaps why rabies seems so tied to our myths of vampires and zombies. The authors present to us the history not only of the cultural effects of rabies, but of the efforts to understand and control it. For me personally, the most fascinating section is the one about Louis Pasteur. One of the founders of medical microbiology, Pasteur didn't just give us the pasteurization that makes our milk products safe. He also took the principle of vaccination that Edward Jenner had discovered when he created the smallpox vaccine in the 1790s, and expanded and developed it to create new vaccines--most notably for anthrax and for rabies. Pasteur is just an extremely interesting figure, and amazing in his dedication to, and success at, applying science to save lives. The most appalling section, in some respects, is the return of rabies to Bali, to a great extent because authorities were so resistant to following sound advice from experts and instead committed themselves to approaches that only looked cheaper and easier in the short run. It's a valuable example of how to do things wrong. Overall, an absorbing and revelatory book Highly recommended.